I'm a violinist, violist and composer in the Boston area. I have a lot of classical training (including a degree from the New England Conservatory) but it was never enough for me. I toured the world for a long time with the Klezmer Conservatory Band but that wasn't enough either. 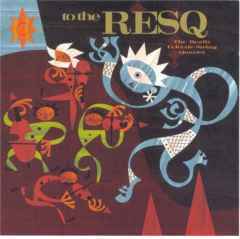 I created RESQ, the Really Eclectic String Quartet to play my jazz/rock/funk/gospel music. We made two recordings. Now I'm working on another side of my musical personality with my new recording, MUSIC. I’ve begun work with pianist Michael McLaughlin on a new performance concept. We call it Free Music, Classic Rules. The idea is that we improvise freely but we apply classic rules of development. So we begin with a brand new theme each time and develop that theme and its accompaniment into a full piece. We’ve been experimenting with forms like sonata, theme and variations and rondo. It is very challenging and deeply satisfying. We’ll be offering a concert on this music on Thursday, January 24, 2002 in room 1A at Berklee College, 1140 Boylston Street, Boston. This spring I received two commissions for new works for strings. One is for Vicki Citron’s Suzuki Class. They will be presenting it in an exchange program in Iceland this spring. It’s called Vicki’s Blues and is scored for four violin parts and one cello part. The parts are for beginning to intermediate players. The other commission is for an improvising string quartet at the Ricers School – a local community music school. More on this one to come. I’ll be arranging Bach’s 4th Brandenburg Concerto to include improvisation (the way Bach intended it) for the Berklee String Orchestra. Stay tuned for performance dates. 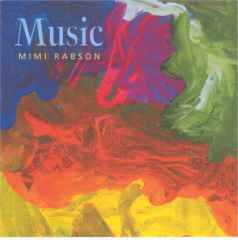 The latest from the pen and the bow of Mimi Rabson is an eclectic mix of electric music. Mimi plugs in for her new works that feature a power trio with a twist – electric violin, bass and drums. Refusing to be labeled or “binned”, Mimi continues to produce music that crosses all the borders. With MUSIC Mimi covers enough musical ground that she has created a new world where her violin speaks the universal language. Noise-rock, post-jazz, electro-acoustic compositions and improvisations are all part of this vibrant territory previously uncharted by the violin. Rick McLaughlin on basses and Harvey Wirht on drums join her. Special guests are Dennis Montgomery III – Hammond B3 organ, David Harris – trombone and organ and Ricardo Manzon – Percussion. Tap the violin to hear "Seoul Phud" from my album "Music"
Tap the violin to hear "Because I Can" from my new album "Music"
Tap the violin to hear "Craven" from my new album "Music"
The Second release from the Really Eclectic String Quartet. This recording features the swinging ensemble and the world-class solos of the first recording with more original music that you can dance to. There is even a James Brown medley that burns the house down. Mimi Rabson is joined by Eric Bindman on the violin, Melissa Howe on viola and James Guttman on the bass.